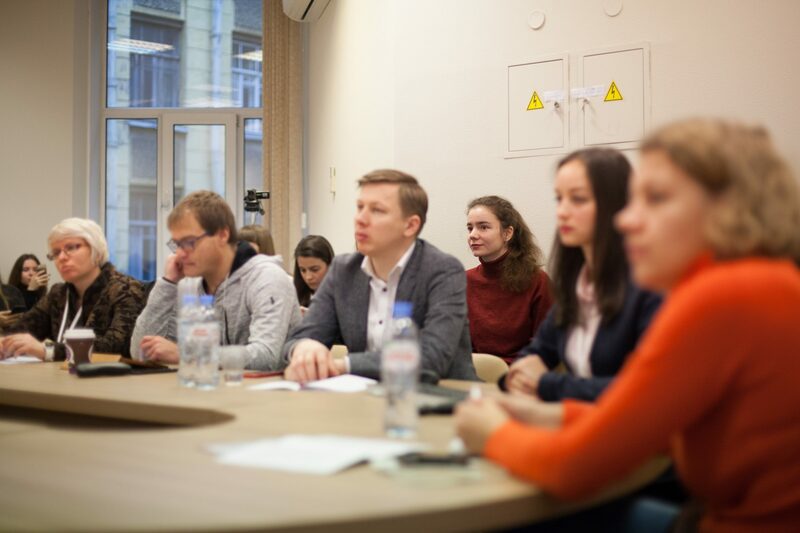 Russian Media Lab researcher Olga Dovbysh together with RML’s partner Kamilla Nigmatullina moderated a roundtable “Local media as strategic resource of authorities” at St. Petersburg State University on 23 November. Dovbysh shared her observations on how authorities in Russia’s towns use local groups on social network sites to communicate with citizens, get information on local events and control local media. Vladimir Kozlov, professor from South Federal University (Rostov-on-Don), mentioned that today both local media and authorities are forced to go digital and communicate in digital space. Sergey Smirnov, docent from Moscow State University, talked about media holding “Moscow media” that produces district (rayon) newspapers in Moscow and gets the most financing from Moscow government. Smirnov noticed that other heads of other regions in Russia adopted such way of consolidation of local media outlets. Aleksander Gradushko, docent from Belarus State University, addressed the current state of affair in local media in Belarus. Growing state control leads to migration of audiences to alternative media platforms. It gives birth to interesting cases of hyperlocal media not dependent on Minsk. On the other hand, Aleksandra Litvinova from press office of Leningrad region government is quite sure about the future of traditional local media due to high trust of people to these sources of information. However, she thinks that traditional local media, newspapers first of all, should change the format and move to digital space in order to become more attractive to the audience. Oleg Chernykh, general director of iVBG.ru, hyperlocal media, covering news of Leningrad region, is very skeptical about traditional media due to their financing dependency on municipal and regional budgets. “Once people get paid just like that, one can no talk of any competition”, he said. General director of “Komsomolskaya Pravda in St. Petersburg” Ivan Vlasov pointed out the importance of brand awareness for local mass media: “When people are overloaded by information, they get back to brands that they trust”. On 29 November, Katja Lehtisaari and Olga Dovbysh participated at workshop on local journalism, organised by Swedish School of Social Sciences. Matthew Weber from the University of Minnesota presented his research on local news ecosystem in the USA and factors impacted on its robustness, while Olga Dovbysh talked about how digital technologies influenced on local media landscape of Russia’s towns and Jaana Hujanen demonstrated results of the research on hyperlocals in Finland. This entry was posted in Yleinen on 4.12.2018 by Janne J Suutarinen.